With our block prints, we have shown value using only black and white. We will move on to graphite to learn how to shade and create the illusion of 3-dimensional forms. Shading seems very interesting to me, and I can't wait to try it out. 3-dimensional forms are very cool looking and complex,but I look forward to trying it out. I think that this will be easier than the carving of the blocks. 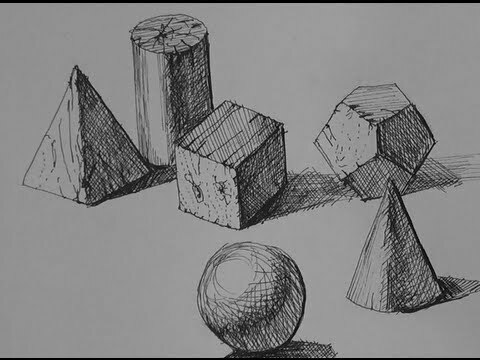 I've never been the best at drawing 3 dimensional shapes, but i am excited to learn more about it and get better. I am excited to do something different from printing. 3D shapes look cool and interesting. I like the block printing and I do not like shading, so I am not so thrilled to move on. However, I do think it is cool how we can take a 2-d paper and make it 3-d with shading. I am excited to move on from block printing and all of its time consumption. With block printing one mess up would ruin the project, but with shading we will be able to afford more mistakes. I think that it will be interesting to learn different techniques of 3D shading. I liked block printing even though it was a little difficult, but shading seems fun. I think it is extremely important in all types of art so I am excited to learn about it. I'm looking forward to being done with block prints, not because I didn't enjoy it but because it's been 2 weeks now and I'm ready to try something new! Learning how to shade with graphite seems really interesting and I'm excited to start it. I am excited to do shading and drawing and move on past block printing. I think drawing and shading will be more fun. i love block printing and am nervous to start drawing cause im terrible but shading in between lines i can do!! I'm excited to be done with the block printing and to start something new. I'm not the best drawer but I am excited to learn!! The shapes turning into forms with just some shading is very cool. I think that working with 3D shapes and graphite sounds like a cool project but may also be challenging. I am looking forward to moving on to something where you can make a mistake and actually go back and re-do it, like with shading you can erase it. Im excited to get done with print blocking because i was not successful in it. Im proud to be done with it and start something else. This looks even harder though. I think it will be interesting getting into drawing and creating 3-d illusions with shading. I think that the more creative side of art can be expressed in this medium as well. making the 3-d shapes should be very interesting but the shading will probably be pretty hard. i like drawing more than carving since i can go back and change the mistake i have made and not be concerned about messing up or the blade slipping and ruining the whole print. the drawing should be fun. I personally can't draw very well, but i'm glad I can learn how to shade properly. Possibly, increasing my drawing skills. I mainly liked the Block Prints because I was allowed to trace at the beginning. I cannot draw very well but I am excited to learn. I feel that creating the cone is easier than creating the sphere. They seem very cool to draw and very interesting. It seem like it takes a lot of focus to draw.